Today on CNN’s State of the Union with Candy Crowley, Sen. Lindsey Graham (R-SC) spoke with Gloria Borger, CNN’s chief political analyst and Dana Bash, CNN’s chief congressional correspondent, about beating back challengers from the right to win his primary and the unraveling situation in Iraq. A transcript and video from the interview are available after the jump. BORGER: Senator Lindsey Graham, thank you so much for being here. GRAHAM: Glad to be with you. BORGER: And, you know, it’s a conservative state, South Carolina. BORGER: You beat them all back. BORGER: So, here is the softball. BORGER: What did you do right that Eric Cantor did wrong? GRAHAM: I think I defined myself in a very good way. I had an air game and a ground game very coordinated. Politics is war in another form. We had a lot of money, but we had 5,200 precinct captains. So, we prepared the ground game. Nobody saw that coming. We really overwhelmed them on the ground. But I was a conservative leader who gets things done. BORGER: Well, you also talked about immigration, and your state of South Carolina so conservative. You’re for immigration reform. You did not run away from it. BORGER: You defended it. How did you manage to win doing that? GRAHAM: Sixty-five percent of South Carolina Republicans support an earned pathway to citizenship. If you secure the border, have more legal immigration, and control who gets a job, 65 percent of South Carolinians say, learn the English language, pay a fine, get in back of the line, pass criminal background checks, wait 10 years. Then you can apply for a green card. If you have done all these things, if you’re a nonfelon, 65 percent of the Republicans in my state said that made sense. BORGER: So, what did — what did Eric Cantor do wrong, though? BORGER: And what lesson is there for Republicans? GRAHAM: I think the first thing you ought to do — this issue is big, right? Take a stand. Thirty-five percent that disagree what I have said, I didn’t run a campaign trying to change their mind. I ran a campaign talking to the 65 percent, but, more than anything else, the biggest fault I — attributed to me by my opponents was that I would work with the other side to get things done. I turned that into my biggest asset. BORGER: Well, that was a problem for Cantor, particularly on immigration. Senator, we have to squeeze in a quick break here. So, stay with us. GRAHAM: To pay the bills. BORGER: And then we are going to be back with Dana Bash. We’re going to switch gears and we’re going to talk about Iraq and whether the American people are ready to spend more money or risk one more life there. Senator Lindsey Graham is still with us. And, Senator, on the issue of Iraq, I know that you have said that you think U.S. airstrikes is the only answer right now. But I want you and our viewers to look at something, the toll so far when it comes to Iraq, 4,424 deaths, wounded, 32,239, and then the cost of money, $770 billion. I have got to ask the question that I’m sure so many Americans out there watching are going to ask. Why spend one more dollar or risk one more life? GRAHAM: Because Iraq and Syria combined are going to be the staging area for the next 9/11 if we don’t do something about it. The people holding ground in Iraq also hold ground in Syria. Economic instability that comes from a collapsed Iraq will affect gas prices and our economic recovery. But the main reason is, if ISIS is not dealt with, that’s the staging area for a new attack on the United States. BASH: … the newer… GRAHAM: Right. BASH: … more dangerous al Qaeda. GRAHAM: Yes. They — the — the predecessor — they’re the follow-on to al Qaeda in Iraq. What they will do is use the area between Baghdad, Kurdistan and Syria to operate with impunity. They have a lot of wealth. They will plan an attack against our country. And my biggest fear is that they’re going to march toward Jordan. And I hope America understands that, if the king of Jordan goes, if he’s the victim of these guys, then the whole Mideast is in turmoil. BASH: And you really thinks that’s possible? BORGER: What makes — what makes you think they have the organization to pull something like that off? GRAHAM: What makes you think they don’t? Look what’s happened. Look what’s happened. They have basically occupied a portion of Syria. They — they took the second largest city in Iraq. They’re going into Baghdad. My number one goal is, let us stop them from going into Baghdad, not the Iranians. If the central government in Iraq collapses — and that’s their goal — they’re trying to get the Iraqi government to collapse — the Iranians dominate the south. They will own all the resources in the south. These guys will operate from Baghdad to Kurdistan, all the way into Syria. They will consolidate economic and military power. They will march towards Jordan and Lebanon. And they will use that space to attack us. If Baghdad falls, if the central government falls, a disaster awaits us of monumental proportions. BASH: Now, the question about the leadership there now, Prime Minister Maliki, he is somebody who perhaps has not done all the things that the U.S. should have — wanted them to do, which is, I think, an understatement. BASH: So is he the right man for the — to lead Iraq right now? BORGER: How do you form a new government? It’s a democracy. GRAHAM: There are plenty of voices over there. He should resign. He’s incapable of bringing the Sunnis back into the fold. Three things have happened in 2010 and ’11 to create this. How did we get there should be the question. Al Qaeda in Iraq, the predecessor to ISIS, was on their back, just about gone. Syria blows up. They get reinforcements from Syria into Iraq. Maliki withdrawals from the coalition. He becomes a sectarian leader. Obama’s administration is completely hands-off, and we withdraw troops in 2011. That’s the perfect storm. BORGER: Why is that President Obama’s fault? Maliki didn’t want to leave a residual force there. GRAHAM: Bush — no, that is not true. That is absolutely a lie. I was there on the ground, at the request of Secretary Clinton. Maliki, Barzani and the Sunnis were willing to accept an American force. We wanted the agreement to go through parliament, which would have been a disaster. They got what they wanted. The Obama administration wanted to say: I ended the war in Iraq. I’m going to end the war in Afghanistan. This was as predictable as the sun rising in the east. I blame President Obama mightily for a hands-off policy when it comes to Iraq. BASH: OK. So, looking forward, Iran, Bloomberg News had an interesting op-ed today, saying that they are sort of the frenemies of the U.S. right now in Iraq. BASH: And people might not realize this, that Iran, who is generally no friend of the U.S., is now potentially working — going to work with the U.S. on Iraq. BASH: How — does that make you feel comfortable or comfortable? GRAHAM: No. Hell no, it doesn’t. Why did we deal with Stalin? Because he was not as bad as Hitler. The Iranians can provide some assets to make sure Baghdad doesn’t fall. We need to coordinate with the Iranians. And the Turks need to get in the game and get the Sunni Arabs back into the game, form a new government without Maliki. But, yes, I don’t want Iran to dominate Iraq. And that’s where they’re headed. If the central government falls, the Iranians are going on the Shia area of — of Iraq, the south. Don’t the Iranians save Baghdad. Let us save Baghdad, so there will be a chance at a second government. BORGER: And we’re going to go to Nic Robertson, our correspondent in Baghdad. BORGER: Very quickly, I know you have been in discussions with the White House. BORGER: Do you — is it your prediction that, eventually, this White House will go for airstrikes? GRAHAM: I think they have to. And it’s stunning to me that nobody in Congress is saying, you have got to come to us first. Everybody in Congress is scared to death of what’s going to happen in Iraq. They won’t come out and admit it. But nobody is saying, Mr. President, don’t use airpower. The air force in Iraq, I think, has been grounded. But Nic will know that better than I do. BORGER: Well, and let me — and let me turn to Nic right now. First of all, Nic, can you tell us how close ISIS is to Baghdad, where you are right now? NIC ROBERTSON, CNN SENIOR INTERNATIONAL CORRESPONDENT: Sure. They’re about three-quarters-an-hour drive to the northeast of the city. Overnight, Iraqi army was told to pull out of the main base in Baqubah. I spent a lot of time on that base with U.S. troops, covered the first elections in Iraq after Saddam Hussein for there, a big base, an important town. That’s now fallen to ISIS. The government told the army to pull out of there. So, this is significant. They have bypassed the line in the sand that the prime minister drew in Samarra, that’s about two hours’ drive north of the city. They’re getting closer. They’re close in Fallujah. But I just want to flip this conversation back, if I may, briefly, to what we were talking about there, the threat to the West. Look, think of ISIS as the new al Qaeda when al Qaeda was in Afghanistan and Pakistan. It straddled the border. It made it hard to tackle them. ISIS straddles the border in Syria and Iraq. Four weeks ago, a gunman, an Islamist gunman went into the Jewish Museum in Brussels, shot and killed four people. When he was captured in France, the prosecutor there said that he had been to Syria, this fighter had been to Syria, got training, and was coming back to attack the West. There are thousands of foreign fighters with ISIS. This is a very real threat. They’re working with Sunni tribes. The Sunni tribes don’t share their views. There’s a lot of scope here for a lot of work and talking to be done. But tackling ISIS for the West is an important issue. And, Nic, I’m going to ask Senator Graham, do you have a question you might want to ask Nic in Baghdad? Nic, what’s your information about the ability of the Iraqi air force to engage the enemy? ROBERTSON: We don’t have any accurate information about them. All I can say is, I’m in Baghdad, and I’m not hearing or seeing anything flying in the air here. What we do know is that ISIS have captured helicopters. They have got pilots from Saddam Hussein-era army flying them for them now. They have co-opted part of the old Baathist army that — that we disbanded, essentially. BORGER: OK. Thank you. Thank you so much, Nic. And I want ask Dana, last question for Senator Graham? BASH: I just want to clarify one thing, Senator. Did you say that we — we absolutely should be working directly with Iran on — to deal with Iraq? Can you just clarify that? BORGER: How do you do that? BASH: I’m sorry. I can’t — it’s sort of hard for me to believe that I’m hearing a Republican saying, sit down and talk with Iraq — Iran. BORGER: Sit down and talk with Iran? GRAHAM: Do you realize what’s happening here? If Baghdad falls and the central government collapses in Iraq, the Iranians are the biggest winner. We’re the biggest loser. ISIS, as Nic says, operates with impunity from Syria to Baghdad. They will hit us again. They will march on Jordan. Three things very quickly. Put American airpower into the game. These guys are not 10-feet tall. Stop the advance on Baghdad. Get people on the ground that the Iraqis trust. Maliki must go. Get a new government in place, right, and hit Syria. If you don’t deal with Syria in a coordinated fashion, maybe with Turkey, regional Sunni Arab states, you will have this happen all over again in Iraq. BASH: He’s saying a front channel. Right? BORGER: … with — with Iran in order to deal with the situation in Iraq? 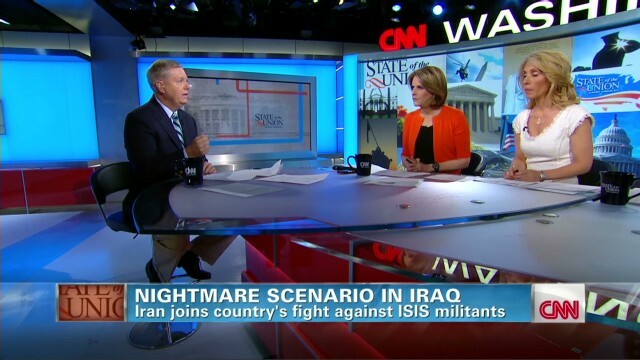 GRAHAM: We should be the ones who save Baghdad, so the central government can survive. But to ignore Iran and not tell them, don’t take advantage of this situation, would be a mistake. BASH: One — one last question. We started the segment by showing the toll to the U.S. in dollars and, more importantly, in lives. Looking — if you’re a — if somebody out there has a friend or a loved one who died in Iraq and they’re looking at this situation now, how do they not think perhaps that their loved one died in vain? GRAHAM: Well, the Iraqi — here’s my — the good news. The Iraqi people don’t want to be governed by ISIS. The Shias don’t want to be governed by Iran. They actually want to move forward. We were well on our way. The lack of a residual force, the stubborn-headed president we have who thinks he knows better than everybody else, who withdrew troops, and exposed this country to the inevitable needs to change his policies quickly. If he does, we can still save this. GRAHAM: Stubborn-headed, delusional, detached president. But that’s the last bad thing I’m going to say. Mr. President, a lot of people want to help you, because we’re in it together. The number of people that could die in this country from getting this wrong is going to be far greater than 4,000, because they’re getting weapons they didn’t have before. The economic chaos to the world is going to be far greater than the money we spent in saving Iraq. This is another 9/11 in the making. The FBI director has warned us in Congress that Syria and Iraq present a direct threat to our homeland. You got foreign fighters from America and Western Europe occupying this battle space. They’re operating with impunity. Get into the game, Mr. President. You can — leaders are judged not by the fact that they never make a mistake, but how they adjust to their mistakes. Bush made plenty of mistakes. I have made plenty of mistakes. Obama has made plenty of mistakes. But we have an opportunity — and time is running out — to turn this around. Get involved with airpower. Stop the march toward Baghdad. Deal with Syria. But get a new government in place as quickly as you can that will bring the Iraqis back together for a counteroffensive. GRAHAM: If we don’t, if we don’t, God help us, because we’re next. BASH: Senator, we could talk about this for hours and probably not scratch the surface. BASH: Thank you very much for coming in.